DSPZ admission list for ND candidates. Delta State Polytechnic, Ozoro ND admission list for the 2018/2019 academic session has been released for the 2018/2019 academic session. 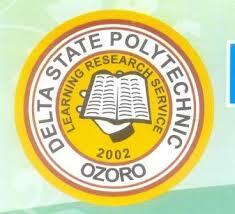 The National Diploma admission list of Delta State Polytechnic, Ozoro has been uploaded online. Candidates can therefore go online to check their admission status. Those who find their names on the released list are have been offered provisional admission into Delta State Polytechnic, Ozoro (DSPZ) for the 2018/2019 academic session. Click on the Check Admission Status. Enter your JAMB REG / Application Number in the required space. All admitted ND candidates should decide of they want to accept or decline the admission offer. Therefore, click here to see how to decline or accept admission on JAMB CAPS. SEE ALSO: DELTAPOLY Ozoro, DSPZ Registration and Clearance Procedures. Congrats to all candidates whose names appear on the ND admission list of DELTAPOLY Ozoro for the 2018/2019 academic session.